The Ryersonian hosted a live debate between the three presidential candidates for the upcoming RSU election at the Rogers Communications Centre (RCC) yesterday. Current RSU president Susanne Nyaga of Elevate, Ram Ganesh of Unify, and Matthew Smith of the Rhino Party, all answered questions in three key areas: accessibility, finances, and social issues. Each candidate had a minute to respond to each other’s comments and to answer each question. In the first portion of the debate, candidates focused on what they planned to do to create more 24-hour study spaces and make Ryerson a more accessible campus for students with disabilities. A focal point on the topic of finance was transparency for students on the RSU’s budget and spending activities. Candidates were asked what they would do to make the budget clearer for students and how they plan to make sure the Universal Transit Pass (U-Pass), which allows unlimited TTC access to post–secondary students, will be available for students in the upcoming school year. They were also asked about their stance on the RSU’s relationship with the Canadian Federation of Students (CFS). Hold a referendum about U-Pass. 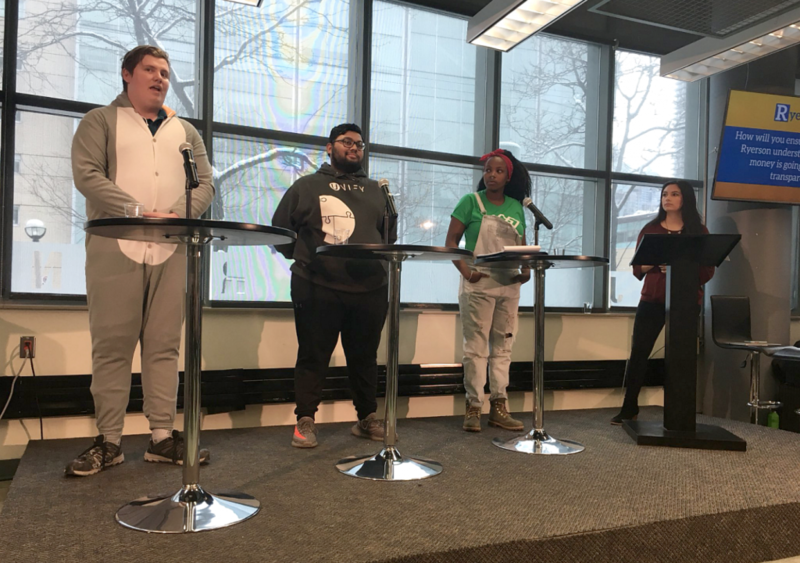 As the Rhino Party doesn’t have a representative to run for VP Equity, Elevate and Unify spoke on behalf of their slates on topics surrounding the proposed removal of Egerton Ryerson’s statue and the changing of Ryerson University’s name, mandatory indigenous education and sexual assault policies on campus. To conclude the debate, candidates were asked to mention one issue they would like to tackle on campus that hadn’t been discussed in the debate. Nyaga talked about student access to mental health services on campus and how she would like to not only properly advertise the current resources on campus, but also try to eliminate the month-long waiting periods for students seeking mental health support. Ganesh addressed board dysfunctionality and the importance of having an unbiased chair that most board members can agree with. He said his party would like to appoint a chair to get semi-annual general meeting agendas approved and that there is action towards making these agendas happen. Smith ended the discussion by talking about the importance of honesty and working across different slates in student politics. He said that campaign promises that are impossible to keep don’t improve student access to education and resources at Ryerson today. There will be a debate held by the RSU between the three slates at a later date. Voting starts on Feb. 13 and will end on Feb. 15. Will The TTC Way speed up your commute?